Even my former CSIS colleague, Zbigniew Brzezinski, normally a sensible if sometimes misguided person, has written in the Financial Times that Washington should deliver an ultimatum to Russia to “cease and desist from military actions that directly affect American assets.” By “American assets,” Brzezinski means the jihadist forces that Washington has sicced on Syria. Brzezinski’s claim that “Russia must work with, not against, the US in Syria” is false. The fact of the matter is that “the US must work with, not against Russia in Syria,” as Russia controls the situation, is in accordance with international law, and is doing the right thing. 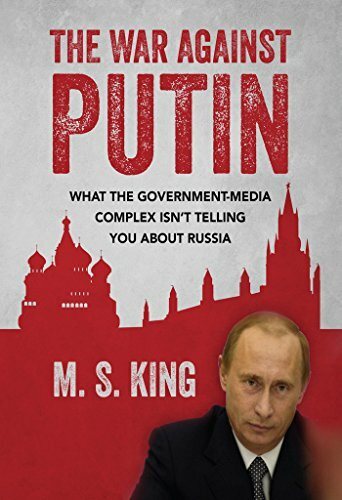 The War Against Putin:... M S King Check Amazon for Pricing. Ash Carter, the US Secretary for War, repeats Brzezinski’s demand. He declared that Washington is not prepared to cooperate with Russia’s “tragically flawed” and “mistaken strategy” that frustrates Washington’s illegal attempt to overthrow the Syrian government with military violence. Washington’s position is that only Washington decides and that Washington intends to unleash yet more chaos on the world in the hope that it reaches Russia. The intolerable state of affairs is the chaos that Washington has brought to the Middle East, chaos that threatens to expand into all countries with Muslim populations, and chaos from which millions of refugees are flooding into Europe. By “freedom of navigation,” Washington means Washington’s ability to control all sea lanes. After all of Washington’s violations of international law and war crimes during the last 14 years, Washington’s claim to be protecting international law is hilarious. Lt. Gen. Michael Flynn, a former director of the US Defense Intelligence Agency, the Pentagon’s intelligence organization, said that Washington needs to understand that “Russia also has foreign policy; Russia also has a national security strategy” and stop crossing Russia’s “red lines.” Gen. Flynn thus joins with Patrick J. Buchanan as two voices of sense and sensibility in Washington. Together they stand against the arrogance and hubris that will destroy us. Crash or a Long-Term Slide?